The event takes place in Lublin at the Faculty of Philosophy of the John Paul II Catholic University. The conference begins on the 25th of October, from 8.30 to 11.30 with the 4th edition of IGSAR: 'Argumentation in Polish and Mathematics lessons as a way of developing integrated skills' for primary and middle school pupils. This is followed by a panel debate session dedicated to the introduction of elements of argumentation theory and rhetoric into the school and university teaching programmes. The panel will be chaired by Michał Federowicz. 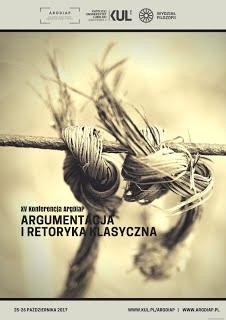 The papers from the 15th ArgDiaP will be peer-reviewed and published as a special issue of the journal Studia Semiotyczne.